The safaris run every day from May to October. 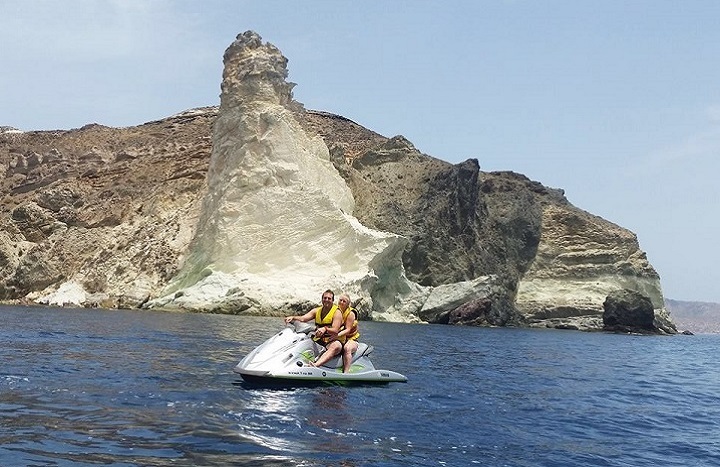 Combine your time at the beach with a jet ski tour along the south coastline of the island. During the safari you will visit places that cannot be accessed by car or on foot, like the White Beach, the Indian Rock and the volcano. Speed trough the water, swim wherever you feel like it and play around enjoying the warm sun and cool Aegean Sea waters. All safaris are done with the company of an experienced jet ski driver. 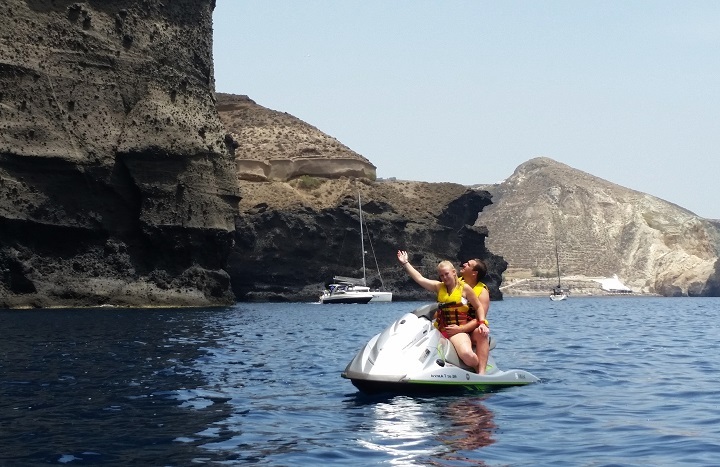 The safaris run throughout the day and each jet ski can fit 2 passengers. 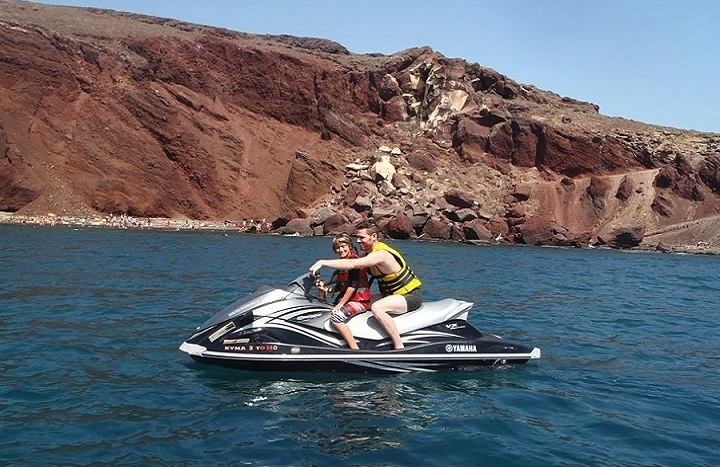 Whether you would like to ride the jet ski alone or with a friend is totally up to you. The starting and finish point of the safaris is at Perivolos beach so you can leave anything you don’t want to take with you in your car or at the water sports stand. The jet skis are brand new Yamaha models, 130hp. The maximum number of participants for the tours is 6. 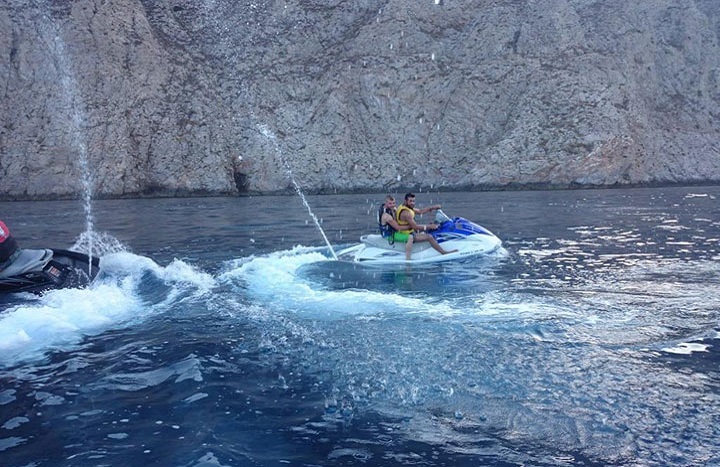 All Jet Ski Safari bookings offered by “X-treme Watersports” can be done securely and safely with our online booking system. Approximate duration depending on weather conditions: 60 – 100 minutes. The volcano and hot springs safari is a tour for explorers! Visit Perivolos, Vlychada, Red Beach, Mesa Pigadia, White Beach, Black Mountain and the Volcano and hot springs. Approximate duration depending on weather conditions: 120 – 180 minutes. The Grand Safari is a tour for adventures! Visit Perivolos, Vlychada, Red Beach, Mesa Pigadia, White Beach, Black Mountain and the Volcano and hot springs. We will also visit Thirasia and Oia. *final confirmation for this safari will be given 2 days prior to the excursion as weather is a major factor for the tour. Approximate duration depending on weather conditions: 180 – 210 minutes. Ready to book? Just fill out our secure form below, giving us three date/time preferences and we will contact you to confirm your booking and give specific pick-up points and times. Please kindly keep in mind that Jet Ski Safari by X-treme sports does not accept credit card payments. When booking, please provide us with your credit/debit card details for security purposes. Your card will only be charged in case of last minute (less than 3 days) cancellation or no-show. Payment of the safari is to be made in cash on the day of the safari.